Our local mountain bike racing series continued on Sunday. The event was the 2nd Annual Masons Midsummer Meltdown. An annual fundraiser led by Cliff Jones to help raise money to build more fabulous trails out at Wyandotte County Lake Park. With the help of all the Masons volunteers, another fine event was held out at shelter #3. Heather Jordan was once again the Chief USAC Official. Most of the fast local riders toed the line for the gravel road start. Garet Steinmetz, Travis Donn, Tige Lamb, Doug Stone, Marc Thierry and Griffin Hamilton just to name a few. A nice size single speed field on the day. Last year I took home a 2nd place trophy. This year that task would be more difficult due to the 20 extra pounds I put on with a strength training program that got out of hand. I asked Cliff if he had a Women's SS class or at least one for long hair folk, but he said I did not qualify due to excessive hair on my legs! After a quick check I agreed. 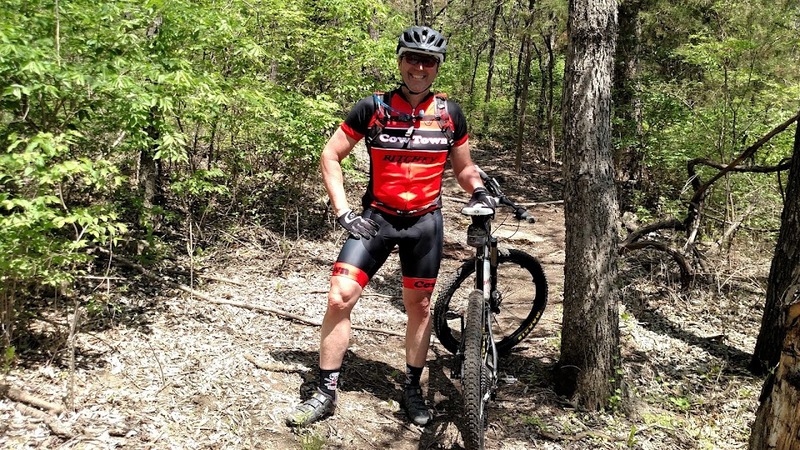 The MMM was Christopher's first mountain bike race of the year and his first Category 2 event. Last year he won the Junior division. He quickly learned that success at Cat 2 requires a little more saddle time. I told him to just wait till he reaches that Cat 1 division. Then he will find out what commitment means. Sally Urdang continued her winning ways on the Meltdown. This time she took a convincing win over Krista Pollman and Alyssa Hetrick. It is good to see some women out enjoying racing their mountain bikes. 19-29 class with Hogan Matson. Shane attacked on the gravel hill climb to open enough of a gap to win in the fastest Cat 3 time of the day - 41:45. I will have to talk to Shane about his upgrade path. He is flying! Tim Greene sat this event out and worked with the Midwest Mountain Bike Patrol to make sure everyone was safe on the day. Tim crashed his road bike recently and was recovering from the injuries that he sustained. I told Tim those road bikes are dangerous but he did not listen to me. The MMM has Meltdown in it's name because of our usual high temps in July. While it was still hot on Sunday and plenty of fluids were required the weather Gods shined on Wyco and we were blessed with mid 80's and the rain on Saturday night missed the trails. Garet Steinmetz put the hammer down on Sunday and crushed the field on the climbs. Garet has always been a great climber and that showed on the Oz climb where he set a KOM time. Local off-road endurance legend Travis Donn showed he also has the speed as he won the Male 30-39 division and kept his Ethos teammate honest the entire day. The winning ways continued for my good friend Tige Lamb. His form is on and he took home a nice payday winning the Men's Cat 1 40-49 division. Tige is heading off to PA for this months USA Cycling Championship. I predict he will do well this year. Good ole Doug Stone once again proved that 26er technology is not dead. Sure it required a little more effort but a 2nd place on the day proved it is the rider more than size of your tire. How much torque is required to snap a crank arm? Just ask local trail Mason and Cow Town member Shane Jones. He snapped off his crank on one of those deceptively long climbs at Wyco. Even though it was not that hot on Sunday I rode a tempo pace that I knew I could finish without having heat issues. That pace was only good for 4th place on the day. This might just have been my last Single Speed race. I really missed gears on a couple of those climbs. You need good fitness to stay on top of the gear and climb well on a single speed. I just don't have it this year. It was good to see Sean Burns on Sunday. He rolled the course on one of his custom built rigs. Hopefully I can ride with Sean later this month when I head out to his new home state of Colorado. Scott Lillis crushed the Men's Cat 2 40-49 field and was the 2nd fastest overall Cat 2 time of the day in 1:25. I see a Cat 1 upgrade in the not to distance future for Scott. His speed on the bike is really improving quickly and his results have proven it. Gerard put in his final training ride for the upcoming Breckenridge B-32. Good luck Gerard and be sure to bring your oxygen mask. Christopher finished the day in 4th place. A poor first lap and a half cost him. We will have to work on his pre-race diet. He has very good bike handling skills and now knows he needs to train to be able to compete in the upper division. The days of just showing up and winning are over. The question is does he have that desire?? I told him is o.k. if he does not. Just riding is fine. After a short break from riding our dirt bikes we ventured down to Drexel, MO for the annual Race in the Park Hare Scrambles. For me this year it was just a Ride in the Park. The event now in its 6th year and continues to grow. The city really gets behind this event and the riders support as well including the juniors. Chuck Martin and his crew do a great job. It was good to get back to the hare scramble events, talk with my old Senior class friends and get a good ride in. I had no ambitions today other than to ride my bike. After a less than stellar start to the year I have decided to put racing off-road dirt bikes on hold. Not feeling the mojo racing this year but I still enjoy riding. With limited riding areas the only time to ride is at the events. Nice safe start at this event - Thank you very much Chuck for that. I rolled off the line and settled in outside the top 5. Christopher settled into a mid-pack start. This was his first time riding his bike after a couple of months off where he spent some time down in Florida with my brother. Jason and Karry Schupp made the trip to Drexel with us today. He has been doing very well as of late despite having some hand problems - possible carpal tunnel. A hand full of throttle at the start got Jason towards the front of the pack. All kinds of country folk come out for the annual Race in the Park and to celebrate our Independence day. These guys really rock their bib overalls. The Drexel course had a crowd entertaining Endurocross section. Following this section was the creek jump. I will look for some pictures of that as Carolynn did not get any of that section. Jason flew to a 5th place finish on the day. A solid result on the day. He seemed to enjoy the high speed sections of the course. I think that 450 cc engine had something to do with it. Christopher handled his first event back well. He finished up 5 laps and handled the course with ease. I enjoyed riding again today and most of my event was uneventful and fun. A few times I had to stop and wait for fallen or stuck riders on the wet slick rocky sections or in one of the mud holes. Most of the course was fast and easy like the above picture but there were plenty of sections that were muddy. The rocky creek sections almost always had a downed rider especially the little junior guys/gals. One negative event during the race. While I was waiting for this junior rider to get assistance on a rocky climb out of the creek bed, of which there was only one good safe line, this riders decides to take us all out and attempts to pass everyone waiting. He hits us all and tagged me really hard. This pissed me off and I aggressively prevented him from getting by. I finally let him by after the finish when it was safe. I can be very aggressive when I want but I am not going to run over a junior rider just to better my place. I attended today's event to just ride, but I do realize that some riders only care about winning and have no regard for safety. Maybe I am getting too old for racing. When you mainly think about arriving alive it my be time to hang it up. I will have to rethink my plan of just riding in these races. Is it fair to the other racers? Maybe just do the practice laps to get in some riding and then just watch Christopher participate.